its 436pm i have been in my pajamas all day. you wake up as early as you can and you stay up as late as you can. and if something good happens you hope it happens some time when people can see it. this morning rodney king got shot in the face. an hour after that our story was on the front page of digg, instead of MSNBC’s story or the LATimes’. why? because we presented it in a way that “the kids” wanted to see it. and we had video that the other two news organizations would never provide. one being the local news clip from KNBC, and the other being the video from the infamous night in 1991. LAist is all about teamwork, communication, and blogging while at work. and being ruthless and about having the eye of the tiger and the nose for news. 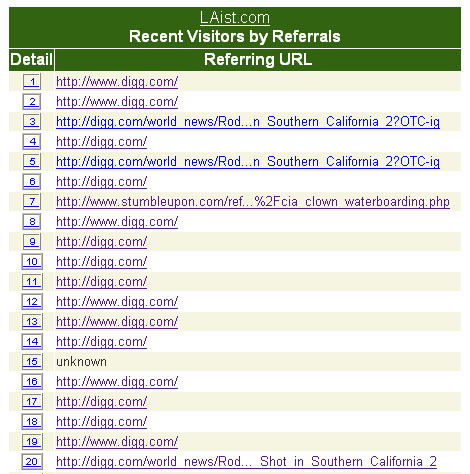 God bless everyone at LAist, Digg, and this crazy thing called the web. now i will take a shower, have a beer, and eat my first meal of the day.